Powdery mildew is a common disease of cantaloupe and pumpkin in Indiana. Occasionally, I observe this disease on watermelon as well. Recently, I have noticed more powdery mildew than usual on watermelon. If left uncontrolled, this disease can cause loss of foliage, loss of yield and lower quality fruit. This article will discuss the biology and management of powdery mildew of cucurbits with an emphasis on watermelon. 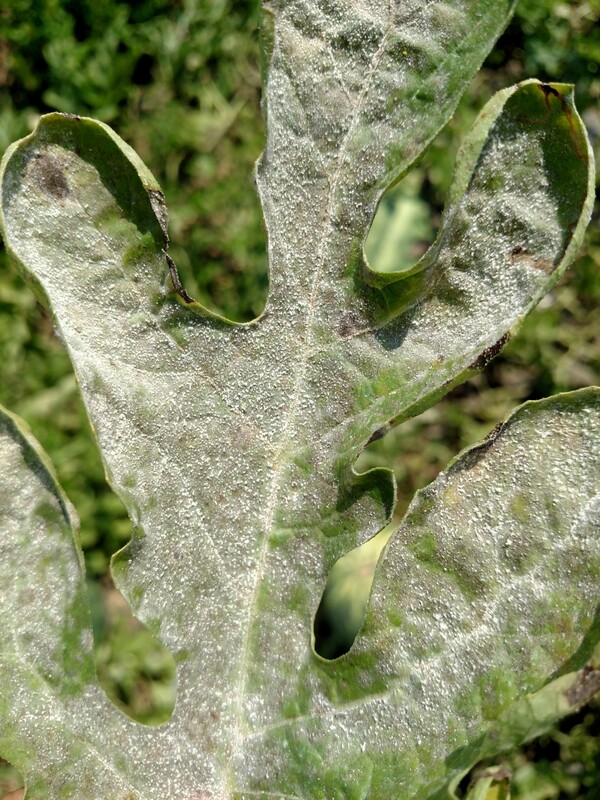 Powdery mildew is relatively easy to recognize; talc-like lesions occur on both sides of the leaf (Figure 1). (This article https://vegcropshotline.org/powdery-mildew-symptoms-vs-variegated-leaves/ has additional information about powdery mildew symptoms. ) The fungus that causes powdery mildew, Podosphaera xanthii, does not require leaf wetness for infection of leaves, only high humidity. The optimum temperature for disease development is 68 to 81°F. P. xanthii may survive for a period in crop residue as a resilient fungal structure, but the disease is so easily windborne, that crop rotation is not always a practical control measure. The powdery mildew fungus does not require leaf wetness to cause infection-only high humidity. Figure 1. Powdery mildew causes talc-like lesions on pumpkin leaves. The fungus that causes powdery mildew of cucurbits does not cause powdery mildew on other plant families. In the same way, powdery mildew of other plant families does not affect cucurbits. Fortunately, commercial varieties of pumpkin and cantaloupe exist with partial resistance to powdery mildew. Most growers, however, find it necessary to apply systemic fungicides to manage powdery mildew, even when using partially resistant varieties. As far as I know, there are no differences in the susceptibilities of watermelon varieties to powdery mildew. Traditionally, powdery mildew symptoms have not been common on watermelon in the Midwest. When I have occasionally observed symptoms of powdery mildew on watermelon, the symptoms have been relatively unimportant (Figure 2). Recently, however, I have observed more powdery mildew symptoms than usual on watermelon in southwestern Indiana (Figure 3, 4). I am not certain that the severity of the powdery mildew symptoms on watermelon I have observed recently will cause a yield or fruit quality loss, but growers should be aware of management options. Figure 2. Powdery mildew has caused round chlorotic lesions on this watermelon leaf and a small necrotic area. 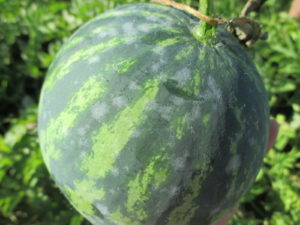 Figure 3: Occasionally, powdery mildew can be severe on watermelon. Although unusual in Indiana, powdery mildew can cause infections on watermelon fruit as seen here. To avoid additional sprays, watermelon growers who are worried about powdery mildew and wish to apply fungicides may want to choose products that are effective on more diseases than just powdery mildew. For example, Luna Experience® should be effective on powdery mildew and gummy stem blight. Merivon® should be effective on anthracnose and powdery mildew. 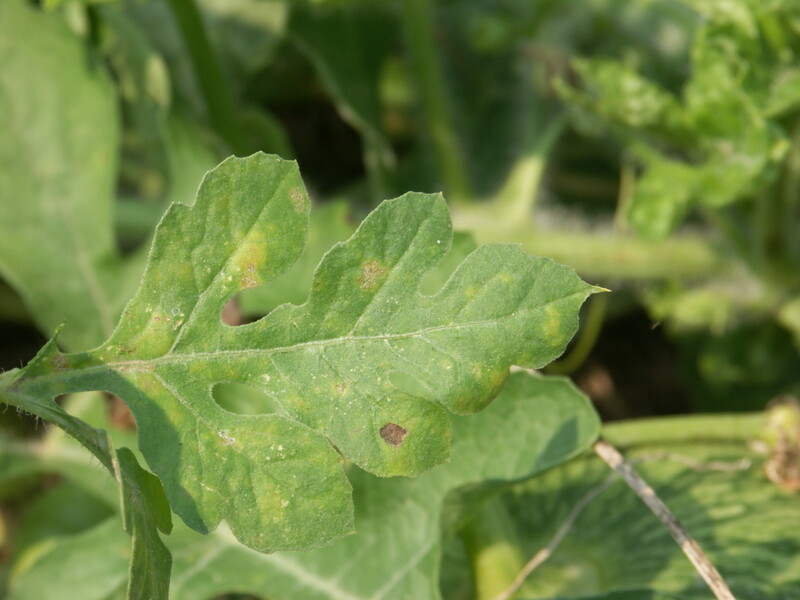 Aprovia Top® has proven effective on powdery mildew of cucurbits plus it is labeled on anthracnose and gummy stem blight. However, I don’t have any information about how effective Aprovia Top® is on the latter two diseases. Inspire Super®, may not be as effective as the products listed above on powdery mildew, however it should be effective against both anthracnose and gummy stem blight. Similarly, fungicides with the active ingredient tebuconazole (e.g., Monsoon®, Onset®, Toledo®, Vibe®) should have good efficacy against gummy stem blight and moderate efficacy against powdery mildew. More information about powdery mildew management can be found in the Midwest Vegetable Production Guide 2017 mwveguide.org. A proposed fungicide schedule can be found at https://ag.purdue.edu/arp/swpap/Pages/SWPAPPresentationFiles.aspx. 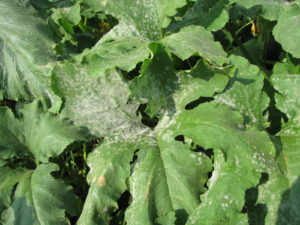 More information about powdery mildew can be found at https://vegcropshotline.org/article/powdery-mildew-of-cucurbits/. Finally, always read the label!